First of all, thanks for all the wonderful birthday wishes for my mom. I started out trying to email a thank-you to every commenter but got bogged down and I know I missed a few people — my apologies! So a big blanket thank you to everyone! I think my mom feels like a celebrity with all this attention. The birthday festivities aren’t over yet — there’s a swanky brunch party on Sunday, hosted by my aunt. 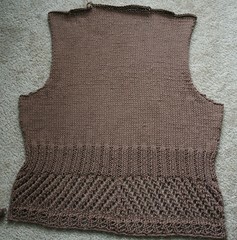 I did finish the back of the short-sleeve cardi last night — see? In reading ahead in the pattern, I found a couple of anomalies. First off, on the back, you do a couple of increases on each side in-between the ribbed waist portion and the armhole bind-offs. There is no mention of doing this on the fronts of the cardi. Huh? I looked at the schematic, and it clearly shows that there is indeed side shaping on the front. I also noted on the schematic that it shows the slant of the vee-neck decreases starting directly above the ribbed portion. 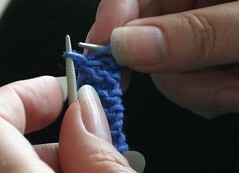 The pattern has you work straight for a few inches before you start the decreases. I checked the Vogue Knitting website for errata — there are none for this design. So I decided to do the shaping between waist and armhole to match the schematic and the sweater back (of course). And I’m going to do the vee-neck decreases according to the written directions and not the schematic, because I think the vee would be far too deep otherwise. I also noted that the pattern has you end up with one more stitch before the shoulder decreases on the front than it does on the back. I will do one extra decrease on the neck shaping to make them come out even. Actually, I’ll be doing several extra decreases, to compensate for the stitches I increased for the side shaping above the waist. I’ll also need to adjust the rate of decrease to accomodate these extra stitches. All of this adds up to some mild annoyance for me. I’m mentioning these issues here for anyone who is thinking about knitting this — keep your eyes peeled for these pattern hiccups. There was a question in the comments asking how easy it would be to size this sweater up. It comes in 4 sizes — 34, 36, 38, and 40 inch finished bust measurement. I think it would be fairly easy to size it up a bit — it’s not a terribly complicated pattern. Can you guess what cast-on I used for this toe? Hint: I’ve whined about it being too fiddly. Speaking of going back to work, I’m pretty sure I heard Lucy heave a sigh of relief as I left home this morning. Today is my mom’s birthday — it’s a special one. I dunno if she’d want me telling her age to the entire blog-o-sphere, so I’ll whisper it. She’s eighty years old today! 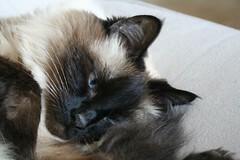 Here she is, a couple of years ago. Yeah, that’s me with her. I’ve changed a little since then. Remember a couple of weeks ago when it was my dad’s birthday and I told you he was one of very few very brilliant people I know? My mom is one of those few as well. Not only is she incredibly smart, but she’s incredibly talented and artistic, too, as well as having a great sense of humor. She draws, paints, sews, knits, cooks, and bakes, all equally beautifully. Any artistic talent and creativity I have comes from her. Thanks, Mom! 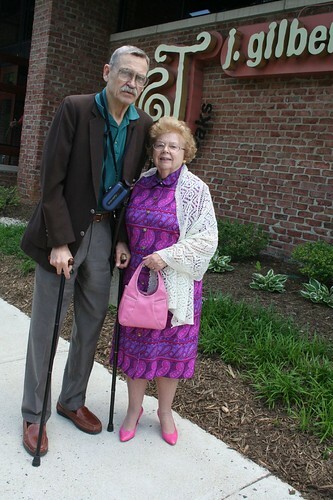 We went out to lunch today to celebrate. 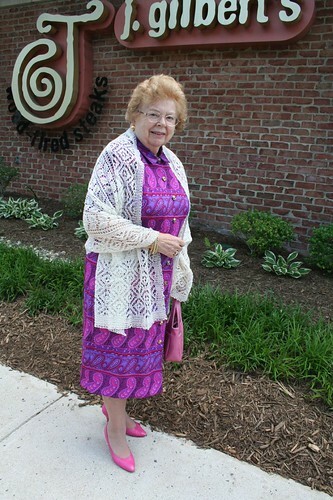 Here she is wearing her birthday gift from me — the Alpine Lace I knitted a couple of months back. And the back of the shawl — looks great on her, doesn’t it? 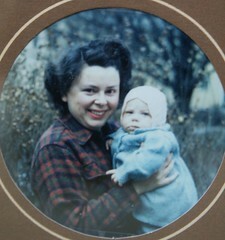 Please leave a comment, wishing my mom a happy birthday! 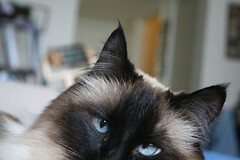 Several of you have asked if the Blue Moon Fiber Arts “Lucy” colorway was named after my Lucy. It was — read this blog entry from last August to learn more about it. Thanks for all your nice comments on the Kiri shawl. It’s now carefully folded and stored on a shelf. 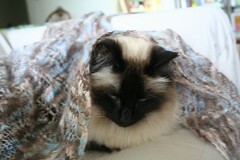 Lucy seemed to think it was for her, a particularly luxurious kitty blanket. We had Words when I took it away from her . . . 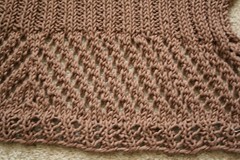 I had a couple of questions about the foam blocks I used for blocking the Kiri shawl. They are interlocking fitness mats. You can get something like them at places like hardware stores and possibly Target. I ordered mine from Amazon.com — a set of the 2’x’ squares here and a set of 1’x1′ squares here. I started knitting something from the Spring/Summer 2007 Vogue Knitting — design #19, a short-sleeve cardigan. If you go to the preview page at Vogue Knitting, you can see a photo of it. It’s shown under the heading “The Paper Chase” a little more than halfway down the page, and it’s the tan cardi at the far right. 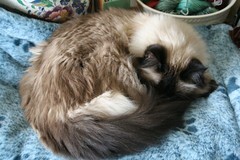 The pattern calls for Lion Brand Yarn Organic Cotton. I am using GGH Big Easy, in a lovely milk chocolate. It’s 100% cotton and is working up at the same gauge as the suggested yarn — 18 sts/4 inches on a US 7 (4.5mm) needle. I’m making the largest size (which has a bust measurement of 40″) and it calls for 12 skeins of Organic Cotton, which is 80 meters per 50g skein. The GGH Big Easy is 70 meters per 50g skein, and I have 13 of them, so I’ll hopefully be okay. I’ve got a good part of the back done, and I don’t think it’ll take more than 4 skeins, so I think I’m okay, yarn-wise. Here’s the back so far. The pin in the side is to denote the start of the armhole — makes it easier to measure. 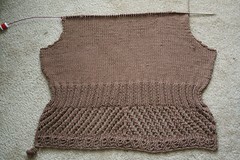 Kiri is a free pattern from Polly at All Tangled Up. 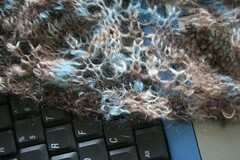 I made my Kiri from Blue Moon Fiber Arts Silkmo in the “Lucy” colorway. 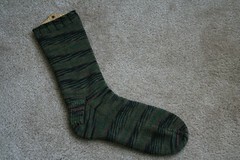 I used a US 8 (5mm) needle and approximately 80 grams of yarn. 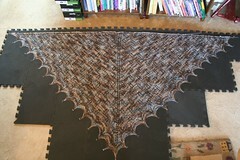 While pinned out for blocking, my Kiri was about 83″ across the top edge and 42″ down the center back. 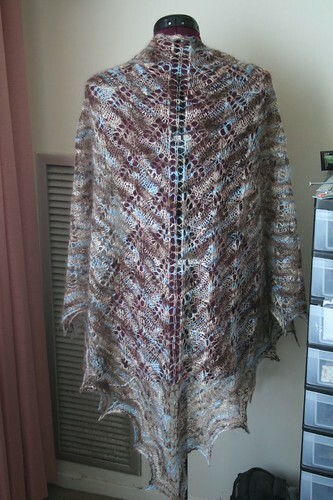 Once released from its pins, it shrunk a little, but it’s still a nice large shawl. My skein was 106 grams in weight so I had 26 grams of yarn leftover. (Are you impressed with how skillfully I figured that one out?) I could have probably done 2 more repeats of the leaf pattern, but I’m glad I stoppedwhen I did — I like the finished size very much. Several of you asked me how I store my stash. 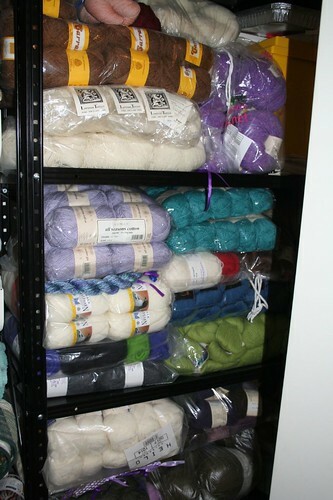 As you could see from the stash peek-a-boo photos, most of it is in plastic bags. Some are the bags the yarn came in, some are bags reclaimed from other items, some are ziplock bags. Nothing is really airtight, as I think it’s a good idea to let the yarn breathe. I don’t have any problems with moths (thankfully!). How did I acquire my stash? 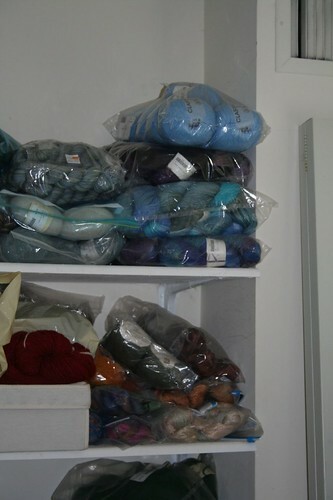 Some of it was purchased with particular sweaters or other projects in mind. Some was acquired “just because.” When purchasing, I just kind of try to figure out how much I’ll need for a sweater or a shawl, and buy enough. So far, that’s worked pretty well for me. I don’t have any good method of organization, like a database. I rely on my memory. Scary, huh? Lucy colorway on Lucy original! I hope you all have been having a good Memorial Day. I started the day my favorite way to start a holiday. 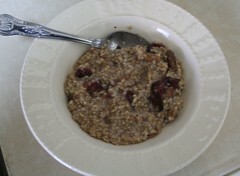 Steel-cut Irish oatmeal with dried cranberries and pecans. Yum! So, Lucy and I have been having a quiet day. One of us has been napping. One of us has been tidying up the condo, including the stash room. 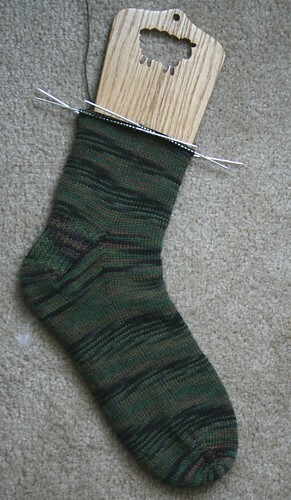 Although I’ve not worked on it since Friday, it seems time for a photo of the Camo Sock. As you can see, I’m knitting it toe-up, and using a gusset and slip-stitch heel. I’ve put in a lot of time on Kiri, though. It doesn’t look like much there, does it? 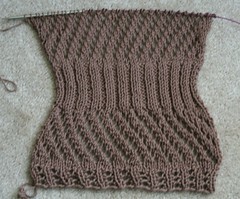 But at the point that photo was taken, I had 4.5 rows left to do before the cast-off. 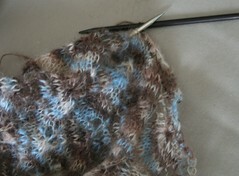 I’m using a 6mm needle to do the cast-off (the shawl is knitted using a 5mm needle). I’m doing a stretchy lace cast-off. 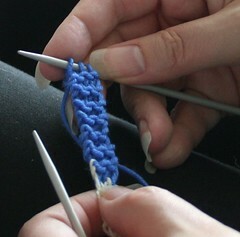 You start by knitting 2, then slipping them back on the left needle, and knit those 2 stitches together through the back loops. 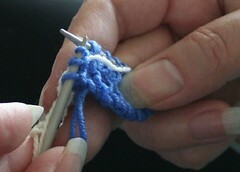 Then knit 1, and slip the 2 stitches back on the left needle, knit 2 together through the back loops. And so on, until you have worked all the stitches. 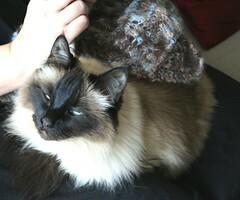 So Kiri knitting will be completed shortly. I will be blocking tonight. 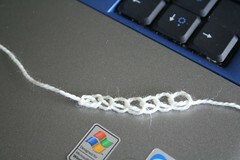 It’s a great pattern, and I do recommend it for lace beginners, as it is a fairly simple pattern and easy to memorize. And if you are doubtful about managing the cast-on that I described yesterday, don’t be. Try it first in larger, smooth yarn and yu’ll see that it’s pretty simple to do. I wonder if you can help me with the cast on for Kiri. I keep screwing it up despite having read about it and trying it several times. I am so frustrated . . . 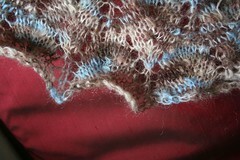 The cast-on used for Kiri is similar to one that I’ve used for other triangular shawls. 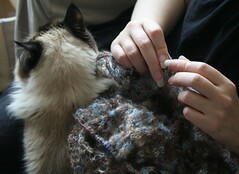 It can be fiddly, particularly if you are doing it in mohair. 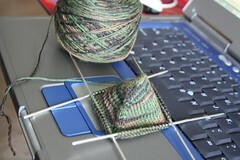 When I started Kiri, I had my doubts about my cast-on, wondering if I was going to have to rip it out and start over. I decided to wait until I had a couple of inches done, and look at it again. It turned out just fine. So I thought I’d do a pictorial here on the Kiri cast-on. I’m doing this in a non-fuzzy yarn so it’ll be easier to see what’s going on. I have a total of 13 stitches — the 3 “live” stitches I started with, the 7 stitches picked up from the garter ridge, and 3 stitches picked up from the provisional cast-on. 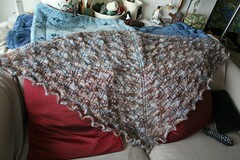 Now I can start following the directions for working the shawl. 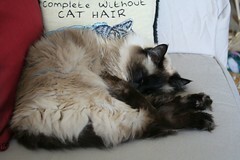 As you can see, Lucy is an integral part of the process! I haven’t gotten much knitting time in on Kiri this weekend — the KOARC and I put on our geek hats yesterday and installed Windows Vista on one of my dad’s computers. It went pretty smoothly, but it took over 5 hours to get everything installed and configured correctly! So, to distract you from my appalling lack of progress, wool pr0n! 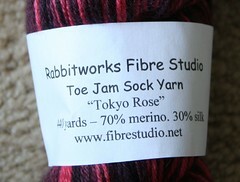 This lovely skein of sock yarn is a wool/silk blend from the dyepot of the lovely Rabbitch. Y’all knew she opened an online shop, right? The winner of the Martha Grimes mystery novel is Mary H. Mary, I’ve emailed you.